CCAL supports strongly (except if in conflict with this letter in which case this letter prevails) all the comments made by the Campaign for Better Transport, ClientEarth, Environmental Protection UK and Friends of the Earth in their responses to this consultation. it reminds us how ‘daft’ Mayor Johnson was to postpone LEZ3 last year. The air pollution problem in London is much worse than most of us have realised. The Mayor announced his decision to suspend Phase 3 of the London low emission zone (LEZ3) on 3 February 2009. As early as 18 March 2009, the London Assembly passed a motion calling on the Mayor to reverse his decision. Subsequently ‘most stakeholders’ supported the retention of LEZ3 in their responses to the consultation on the Mayor’s draft Transport Strategy. The Consultation then goes on to say: the first of those options is ‘no longer feasible’; the second is being consulted upon; and the third is not being consulted upon i.e. the Mayor has only one proposal which is to delay LEZ3 until 3 January 2012. CCAL does not comment further in this letter on the so-called ‘Proposals’ 1 or 3 other than to say the information about them is as inadequate as it is about Proposal 2. The continuing failure to provide adequate information means that CCAL and other consultees are unable to give intelligent consideration or an informed response to the option(s) being consulted on. For example, it is difficult to think of information which could be more relevant to the public consultation than that which shows the health impact of poor air quality in each part of London, and the extent to which the postponement of LEZ3, the removal of the WEZ and the Mayor’s other air quality proposals will result in EU air quality laws continuing to be breached. If this information is not provided in good time, and at least 21 days prior to a final closing date for this consultation, we reserve the right to challenge this and other related consultations, and any decision taken following those consultations, in particular on the basis that such consultation has been inadequate and has failed to meet accepted public law standards. TfL therefore should extend the deadline for comments on the current LEZ3 consultation by three or more weeks. CCAL rejects (yet again) the Mayor’s proposal to postpone LEZ3 until 3 January 2012. To mitigate the financial impact on operators, CCAL urges the Mayor most strongly to use part or all the £55m net annual income from the western extension of the congestion charging zone (WEZ) to subsidise retrofit and scrappage costs for the most vulnerable operators. Amongst other things this would create a valuable precedent for linking directly road user charging with public health benefits and ‘green’ jobs. Phases 1 and 2 of the LEZ entered into force on 4 February and 7 July 2008 respectively. CCAL continues now to oppose the delay of LEZ3 to 3 January 2012. Measures such as this are needed now not in future years. The Mayor must take more urgent, more radical action now to improve air quality throughout London and ensure full compliance with air quality laws. You will appreciate that with consultations ongoing about the postponement of LEZ3 and the removal of the WEZ it is important to have a clear understanding of the context of those consultations. In this respect the Integrated Impact Assessment for the draft AQS is a vital document and we note it has still not been published. In the absence of that document, and in the absence of the requisite information in the LEZ3 consultation papers themselves, CCAL is prevented from responding fully to the LEZ3 consultation (or on those relating to the draft AQS or the WEZ), including in relation to whether the proposed deferral of LEZ3 to January 2012 is compatible with the UK’s obligation under air quality laws. iv. the TfL commissioned study of measures to address concentrations at ‘priority locations’ based on international best practice (as referred to in ‘Box 9’ on page 63 of the draft AQS). iv. any related work done for TfL by ERG/King’s College London, TRL or others, equivalent to that undertaken for PM10. d) details of any measures that were considered for inclusion in the draft AQS, but ultimately rejected, and the reasons for such rejection. In particular, the modelling undertaken of the likely impact of these measures on air quality (referred to in Section 1.6 of the draft AQS). As you will be aware, fair consultation must take place at a time when proposals are still at a formative stage; sufficient reasons must be given for proposals to enable consultees to give those proposals intelligent consideration and to provide an intelligent response; adequate time and opportunity should be given for a response; and the product of the consultation must be conscientiously taken into account by the authority when reaching its decision: R v Brent LBC ex p Gunning (1985) 84 LGR 168, approved in R v North and East Devon Health Authority ex p Coughlan  1 QB 213. The continuing failure to provide the information above means that CCAL and other consultees are unable to give intelligent consideration or an informed response to the various options being consulted on. It is difficult to think of information which could be more relevant to the public consultation on the postponement of LEZ3 than that which shows the health impact of poor air quality in each part of London, and the extent to which the postponement of LEZ3, the removal of the WEZ and the Mayor’s other air quality proposals will result in air quality laws continuing to be breached. If this information is not provided in good time, and at least 21 days prior to the end of each consultation, we reserve the right to challenge this and other current consultations, and any decision taken following those consultations, in particular on the basis that such consultation has been inadequate and has failed to meet accepted public law standards. The failure to publish important information with the current air quality-related consultations points to serious failings by London government and a lack of fairness. It is irresponsible of the Mayor to postpone LEZ3 as he is doing. To implement the scheme urgently and mitigate the financial impact on vulnerable operators, CCAL urges the Mayor most strongly to use part or all the £55m net annual income from the WEZ to subsidise retrofit and scrappage costs for the most vulnerable operators. Amongst other things this would creates a valuable precedent for linking directly road user charging with public health benefits and ‘green’ jobs. Which borough has expressed what concern about which limit value and when? Will the Mayor publish the information? Why are these important concerns not mentioned in the three current consultations i.e. the postponement of LEZ3, the draft AQS and the removal of the WEZ? Why has the Mayor not listened to stakeholders and the London Assembly? “Defra has undertaken modelling of London’s air quality in 2011 to inform its submission to the European Commission for an extension to the PM10 EU limit value deadline from 2005 to 2011. Their modelling only included current measures (e.g. the two initial phases of the Low Emission Zone affecting HGVs, buses and coaches; some hybrid buses etc) as well as natural turnover and national measures. Defra’s modelling showed that even without taking further action (i.e. not implementing LEZ Phase 3) London should be compliant with EU limit values by 2011. However, there was no margin of safety [CCAL emphasis]. This is a significant risk to compliance with EU limit values given the variations in air quality year by year due to changes in weather conditions and the contribution from external sources. You will be aware that Article 22 of the Directive requires that a Member State ‘shall demonstrate how conformity of will be achieved with the limit values before the new deadline’. Commission guidance similarly requires that predictions of how PM10 levels are likely to fall must be ‘realistic and reliable’. It is clear, even from the IIA for LEZ3, that hot weather and/or transboundary air pollution would/are scupper/ing the UK’s chance of achieving full compliance with the PM10 daily limit value throughout London – which is a key requirement of a time extension being granted. Furthermore, with the TEN including the WEZ, when the Mayor has said he will remove it, it seems even more ridiculous to propose postponing LEZ3 to January 2012. Surely this evidence will add to the pressure on the Commission to reject the UK’s renewed application for a time extension for PM10. Will the Mayor accept finally, after two years of backward steps by him on air quality, that a time extension for PM10 until 2011 cannot be justified? What else does the Mayor know about the likelihood of infraction action that could cost up to £300m per year per pollutant? The original impact assessment for LEZ3 was prepared when Londoners thought there were 1,031 premature deaths in 2005 due to PM10. On 28 March 2010, the Mayor estimated there are some 4,300 premature deaths a year in London due partly to long-term exposure to dangerous airborne particles (with a cost of some £2bn a year). With the health impact of poor air quality realised to be much worse than before it is irresponsible of the Mayor to be postponing key mitigation measures not implementing them. What can be more important than knowing who is affected by poor air quality so people: are warned about the health risks; can express their concerns; and can propose and request measures that are targeted appropriately? How have these new numbers changed the economic case for LEZ3? When will the Mayor’s health study be published? iv. ‘National Travel Survey – Analysis of travel trends for London’ dated June 2008’ (19 pages). Amongst other things, these studies show the LEZ is working and provide further evidence the Mayor was wrong to postpone LEZ3. Indeed, the preliminary assessment made by the first of those reports says “The report notes potentially significant trends in levels of black carbon and PM2.5 [i.e. fine particulate matter] across the period of scheme implementation”. These key studies do not seem yet to be available to the general public to inform their response to the LEZ3 and other air quality-related consultations. Why was it necessary for CCAL to seek this information under the FOIA / EIR? Why were these studies not published before the LEZ3 consultation was launched on 17 May 2010? Does the Mayor accept these omissions point to serious failings by London government and a lack of fairness? When will these studies be published? How much weight, if any, has been put on the inequality arising from non-white British being exposed, on average, to 17% more of the deadly PM10 than white-British and black-British being exposed, on average, to 30% more of the deadly PM10 than white-British? Does the Mayor think of inequality in terms of ‘access to minibuses’ (though important) rather than lives cut short by air pollution? This seems to be a subjective, even whimsical, judgement which fails to take account of the need to comply with air quality laws to protect public health. Does the Mayor think public health laws are optional – that they do not need to be complied with in full? Let’s remember, dying prematurely is even worse than losing your job. How can we comment intelligently on a proposal that fails to: tell us about its direct impact on NO2 limit values; tell us what will happen if a time extension is not obtained; and does not address how annual mean concentrations of NO2 will be kept below 60 micrograms per cubic metre (μg/m3) (which is a legal requirement) if a time extension is obtained? Similar information is omitted from the current consultation along with rafts of other crucial information. How can we comment intelligently on a proposal that fails to: tell us about its direct impact on PM10 limit values; tell us what will happen if a time extension is not obtained; and does not address whether annual mean concentrations of PM10 will be breached anywhere in London having been attained? What is the total cost to ‘green’ industries and jobs of the Mayor’s decision to decide to suspend a measure which he admits is important for compliance with air quality laws? Has the Mayor taken into account all relevant costs in his latest proposal(s)? The Mayor is wrong to assume the UK will obtain a time extension until 2011 for PM10 and 2015 for NO2 to comply with limit values. Further, even if a time extension were to be obtained for NO2, it is unclear from any of the Mayor’s current air quality related-consultations (i.e. LEZ3, draft AQS or WEZ) whether the annual mean concentrations would be kept below 60 μg/m3 from 1 January 2010 which would be a requirement of such a time extension. 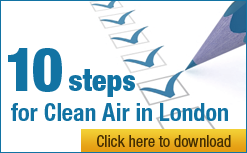 CCAL considers the UK does not meet the requirements for a time extension for either PM10 or NO2 in London. Under what precise legal power or duty does the Mayor believe he can choose to prioritise ‘economic benefits’ over the need to comply fully with public health laws? These are significant omissions individually but, collectively, they suggest serious failings by London government and a lack of fairness. CCAL has urged the Mayor of London and TfL on numerous occasions, including in very detailed submissions, to introduce one or more additional inner low emission zones (or ‘Clean Air Zones’) in London. This or these would be in addition to LEZ3 and would ban the most polluting diesel vehicles from the most polluted parts of London. CCAL continues to advocate strongly the implementation of one or more of these additional inner LEZs in London. The implementation earlier or simultaneously of a stronger, Berlin-style, inner LEZ might allow the Mayor to slow the tightening of the outer LEZ (all other things being equal). CCAL is not repeating details here, since both the Mayor and TfL have long had such a proposal from CCAL, but would be pleased to meet the Mayor or senior TfL officials to discuss it.